New York, NY – October 12, 2016 – Urban Resource Institute (URI) and Nestlé Purina PetCare today hosted a ribbon-cutting ceremony to celebrate the opening of the Purina Pet Haven, a space where residents and their pets can play in safety, located onsite at URI’s Urban Women’s New Beginnings domestic violence shelter. The Purina Pet Haven is the third park of its kind at a URI shelter and is part of the URIPALS (People and Animals Living Safely) program. URIPALS is the only program in New York City and one of the few nationally that allows survivors of domestic violence to live in a shelter apartment with their pets. To date, URIPALS has helped 59 families with 83 pets, including 46 cats, 27 dogs, 8 turtles, a betta fish, and a bearded dragon, escape domestic violence. The Purina Pet Haven will provide survivors of domestic violence and their families (including pets) with a safe and calming retreat where they can heal together while in shelter. Having a secure space onsite allows survivors to be outside with their pets without running the risk of encountering their abuser. 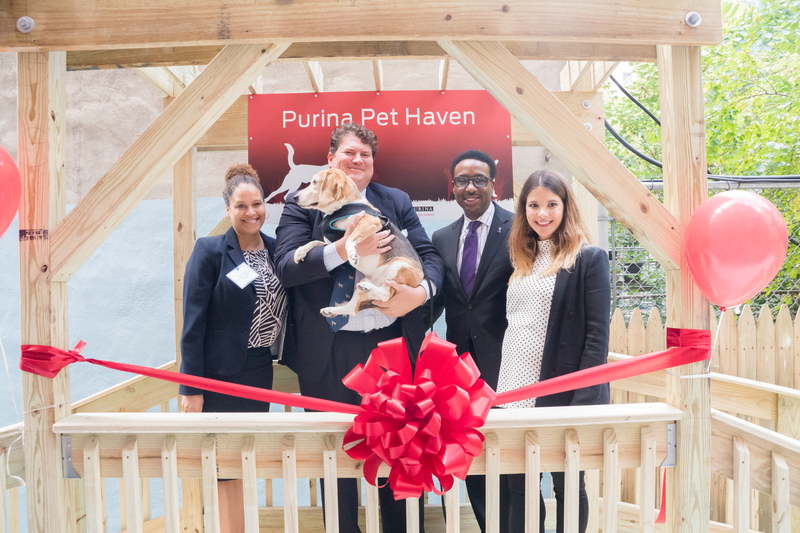 The opening of the Purina Pet Haven marks the third Pet Haven built as part of URI and Purina’s partnership, following the opening of the first Purina Pet Haven in Brooklyn in March 2014 and another in Harlem in October 2015. These three are the only pet parks in domestic violence shelters in New York City.